I very happy for this self tie bowl. Product is good, but I think you can sending manual how to tie, somebody dont know,all the best. The product was as described and was satisfactory in every way. Very stylish tie- perhaps more of a brownish "dot" than I expected- but still very nice, and well made- adjusts easily, and ties neatly- happy camper! 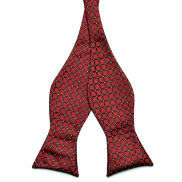 With a freestyle or self-tie bow-tie you express to the world that you are indeed a discerning gentleman. You do not cut corners and you believe that the best things in life are worth the time you invest in doing them. It takes a little practice to master the art of tying a freestyle bow-tie but once you get the knack of it, the results will be worth the effort. Look through the menus below to investigate all of the various choices that we offer. 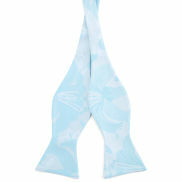 Freestyle bow-ties are quite distinctive to the connoisseurs and have that old-school charm about them. You would never catch James Bond wearing a clip-on bow tie now would you? 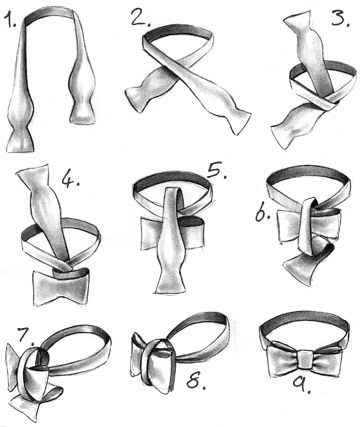 It is certainly easier to tie a regular necktie than a freestyle bow-tie so the drawings we provide show the 9 steps required to accomplish the feat. Do not worry, after a little practice you should have no problem tying up your freestyle bow-tie. Bow-ties can replace neckties on any occasion. 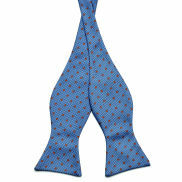 Because of their compact size, bow-ties can be quite extravagant in solid colours, stripes and polka dot patterns. As with neckties, bow-ties must also match your suit. The rule of thumb for a bow-tie's size is that it should be wider that the outer edge of your eyes but no wider than the broadness of your head. Bow ties have a very long history, how is that for a conversation starter?